electron from moving into the proton, is the centrifugal force on the electron caused by its circular path around the proton. This same sort of balance is produced if a ball tied to string was whirled in a circle in the air. The centrifugal force exerted tries to move the ball out of its circular path and is balanced by the string (the attractive force). If the string should break, the centrifugal force would cause the ball to fly away. Actually, this is what happens at times with atoms. The attractive force between the electron and proton sometimes is not great enough to hold the electron in its circular path and the electron breaks away. In an atom, unlike electrical charges attract and like electrical charges repel each other. Electrons repel electrons and protons repel protons, except when neutrons are present. Though neutrons have no electrical charge, they do have the ability to cancel out the repelling forces between protons in an atomic nucleus and thus hold the nucleus together. When there are more than two electrons in an atom, they move about the nucleus in different orbits (fig. 1-2) which are referred to as shells. 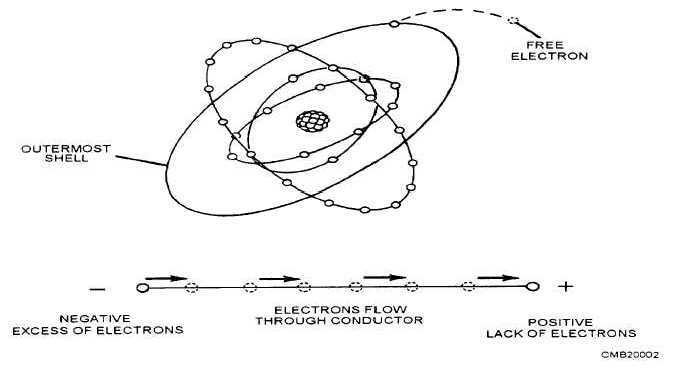 The innermost shells of the atom contain electrons that are not easily freed and are referred to as bound electrons. The outermost shell will contain what is referred to as free electrons. These free electrons differ from bound electrons in that they can be moved readily from their orbit. If a point that has an excess of electrons (negative) is connected to a point that has a shortage of electrons (positive), a flow of electrons (electrical current) will flow through the connector (conductor) until an equal amount of electrical charge exists between the two points. A charge of electricity is formed when numerous electrons break free of their atoms and gather in one area. When the electrons begin to move in one direction (as along a wire, for example), the effect is a flow of electricity or an electric current. Actually, electric generators and batteries could be called electron pumps, because they remove electrons from one part of an electric circuit and concentrate them in another part of the circuit. For example, a generator takes electrons away from the positive terminal and concentrates them at the negative terminal. Because the electrons repel each other (like electrical charges repel), the electrons push out through the circuit and flow to the positive terminal (unlike electrical charges attract). Thus we can see that an electric current is actually a flow of electrons from a negative terminal to a positive terminal. Figure 1-2. - Composition of electricity.